Designed to provide year-round protection, HomeGard will kill adult fleas and larvae in your home, and prevent eggs and larvae from developing there for approximately 12 months. 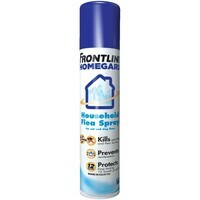 Frontline HomeGard is an aerosol surface spray for use on carpets, cracks and crevices in flooring, pet bedding and soft upholstered furniture. It is not suitable for hard furnishings as fleas don’t normally reside in them. Using Frontline HomeGard in your home alongside Frontline Plus or Frontline Spot-On on your pets provides an effective, integrated approach to flea control. Do NOT apply Frontline HomeGard directly to your pet. Ensure they are not in the room before use and until treated surfaces are dry.